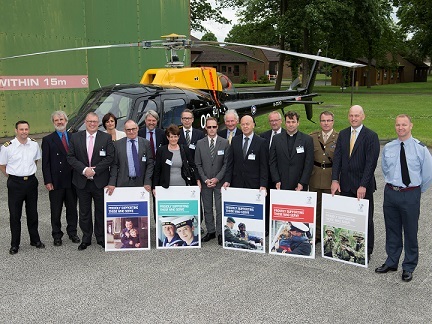 Pictured: Wace Morgan partner Keir Hirst is pictured at RAF Shawbury, along with representatives of the other local organisations involved with the Armed Forces Covenant. Wace Morgan has strengthened its links to the Armed Forces by agreeing to sign the Armed Forces Covenant. The covenant is a government initiative which acts as a promise from the nation that those who serve or have served in the armed forces, and their families, are treated fairly when receiving any public and commercial service. A range of partners such as businesses, local authorities, charities and the public throughout the country are being asked to sign a specially-drawn up document as a commitment to service people. Partner Keir Hirst said that this was the latest step in a long-standing partnership between the firm and the county’s Armed Forces. “As a firm we have provided specialist advice to current and retired members for many years, with an understanding of their unique needs,” he commented. David Fairclough, from the Community Enablement and Armed Forces Covenant Team at Shropshire Council, who also attended the ceremony at RAF Shawbury, said: “To be effective the covenant requires commitment and co-operation from a wide range of organisations such as local authorities, the NHS, Job Centre Plus, schools and colleges and all manner of other service providers and private and commercial companies such as those here today.